When I made them with the kids I placed a big bowl of popcorn in the middle of the table, gave them each a cup and let them scoop up the popcorn and fill up the hands. 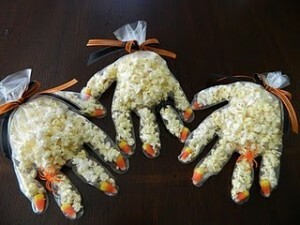 To make the witch's nails make sure a candy corn is placed in each finger slot first. Once the hand is full tie it off and decorate with rings. On this cold and rainy weekend we are in need of a few crafts - this is perfect for both snacking and making a craft!